Over the past two decades, Andrew Niccol has written and directed six feature films. None of them revolve around a superhero, and none is a sequel, spin-off, or reboot. For better or worse, the New Zealand-born writer-director has yet to make a movie he hasn’t wanted to make. From genetics (Gattaca) to immortality (In Time) to colonization (The Host), his work consistently roots heady topics in dystopian visions of the future. Perhaps it’s this tendency to look forward that makes Good Kill such a jarring transition back to reality. The film focuses on Major Thomas Egan (Ethan Hawke), a celebrated Air Force pilot who’s been reassigned to drone duty. Now back home with a family eager to have him away from physical combat, Egan grows discontent and despondent. Aside from the precarious ethics of the position, the man doesn’t see drone piloting as a satisfying substitute for what he loved to do. His wings have been clipped. We spoke with Niccol about the bizarre lives of drone operators, filmmaking as a drug, and why he’s never watched a single one of his own movies. The A.V. Club: A line in your script reads, “War is not a first-person shooter.” Are you skeptical of what we’ve done, and continue to do, in the Middle East? Andrew Niccol: That’s what Bruce Greenwood’s character says. I’m just really trying to tell it like it is, warts and all. And you know, it’s all factual—I didn’t make anything up. 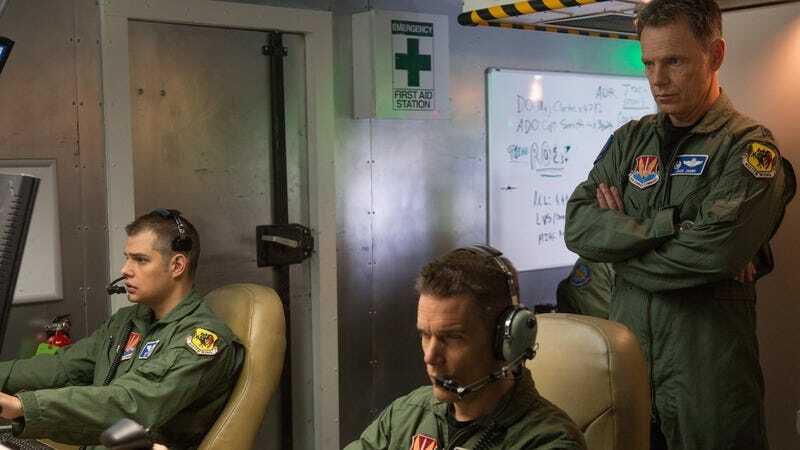 When Bruce Greenwood was ordering more drones and jets, that was a fact. That’s why I was drawn to the whole thing. Ethan Hawke’s character—there’s going to be more like him. I think we’re going to fight more remote wars. AVC: He’s a character who has a certain nostalgia for a bygone era of warfare. AN: When we were thinking about his backstory, we imagined that he saw Top Gun as a kid. And he wanted to become [a top gun], and he did, and now he’s ripped out of a cockpit. A lot of the movie from his point of view is about the death of flying. He’s grieving that loss. Even the drones depicted in the movie are antiquated now. They’ve got new drones that can take off and land from an aircraft carrier. AVC: And did you ever want to be a top gun? AN: My father was in the Air Force, so it sort of touched me. AVC: What sources did you use for your research? AN: Well, there’s no strike that takes place in the movie that’s not well documented, but Ethan’s character is a composite character, and I used two ex drone pilots quite heavily to authenticate what I was doing. So they were on the set the whole time, and they were teaching Ethan and Zoë [Kravitz] how to fly from 7,000 miles away, how to say and do the right things. AVC: And these two ex-pilots, did they have fond memories? Or were they, as in the film, upset and bitter? AN: They weren’t exactly bitter, but there’s a lot of burnouts in drone programs—not that they’re allowed to call it a drone program. They call it “UAVs” [unmanned aerial vehicle]. The problem is, we would ask them about, “Is it like playing a video game?” And they would be like, “Yeah, it would be like playing the most boring video game of all time.” There’s a lot of monotony to it. The way it’s depicted in the movie, they would watch a compound for a month, waiting for a so-called bad guy to show up. It’s monotony punctuated by the most horrific action and then it’s back to the monotony. AVC: “Monotony punctuated by the most horrific action” may not be a video game people would want to play. AVC: Did you say this aloud? AN: I said it silently to myself. I’m not here to pass any kind of judgment, I’m just trying to shed some light on it, because for me, making the movie, I was educating myself at the same time. Mostly, I come at it from Ethan’s point of view, and all the characters have a slightly different take on what’s going on. But if I’m closest to anybody it would have to be Bruce Greenwood’s character, because he’s heavily conflicted. He says toward the end of the movie—and I have no answer for his question—“If we stopped killing them, do we think for a second they’d stop killing us?” And so can we declare victory and go home? Because if and when we ever pull the troops out of Afghanistan—which, by the way, is called America’s longest war, since you’ve been there for 14 years—I don’t imagine for a second that the drones are going home. So how are we going to police that part of the world? AVC: It’s the longest war that very few people care about in this country. AN: It’s been going since 9/11. I was on my way from L.A. to New York that day when my flight got canceled. I’m not a soldier or anything. I’m a filmmaker, not a policy maker, I’m not running for anything. It was such a brutal attack. On the flip side, it’s been 14 years, when is it going to be overkill? It’s actually why I set the film in 2010, during the greatest escalation in drone strikes. We were coming up with all of these words like “proportionality” and “preemptive self-defense,” which basically means, “I think you’re gonna kill me so I’ll kill you.” We’ll say anything to avoid saying “killing people.” Orwell would be spinning in his grave the way we say we’re going to prosecute a target or neutralize a threat. And none of these words are words that I made up. AVC: In a way, with Lord Of War and now Good Kill, you’ve been chronicling the longest war for over a decade. AN: Yes, well, in Lord Of War, I would see a guy on the front page waving a Kalashnikov in the air, and I would think, “How did that get into his hands?” And when you start researching that, there’s such a fascinating underbelly to a war. And it was the same with Good Kill because it was a culmination of all these drone strikes, and I would wonder, “How the hell did that happen?” What are the mechanics of going about that? And when you find out that there is a base located outside of Vegas and you find out about these guys who are operating, you just think, “Whoa, it’s a new type of war, it’s a new generation of soldier.” How are they going to cope with going to war at home? A lot of people have said to me, “Andrew, why the hell did you set it outside of Vegas?” And, of course, I didn’t, the U.S. military did. And for very good reason, because the terrain around Las Vegas is very much like Afghanistan. And that’s where you train. And that’s where you basically practice flying around those mountains, and then you pick it up the next day and fly it over Afghanistan. AVC: For Hawke’s character, who often exhibits addictive behavior, Vegas seems like an apt setting. AVC: Does filmmaking deliver a similar high? AN: It’s more of a low. But it’s similar in a weird way. There are long moments—it’s a lot of drudgery. And then it’s sort of punctuated. It’s sort of a lot of gray, with little shafts of light, where an actor will do something unexpected or something beautiful will happen. So in a weird way it’s like being a drone operator. AVC: Ethan’s character seems very much wrapped in this idea of flying. It turns the profession into an obsession at this point. Does this ever happen to you in directing? Is your identity ever sucked up by whatever project you’re immersed in? AN: I have so much to grapple with, I don’t think too much about me. People call it the “dance of a thousand egos” when you make a movie. If only I had time to worry when I was making a movie about what the hell I was doing. It’s sort of a marathon every day. And then at the end of it, you beg the producers for five more marathons. AVC: Do you worry less now that you’ve been doing this for more than a decade? AN: No, I don’t. I would be really nervous if I wasn’t nervous. I would hate to feel complacent. It would mean that somehow I didn’t care. I would hate to get to that place. I would stop, because you have to—it sounds pathetic, but I have to kind of love what I’m doing to get up every day and do it. I remember an agent came to me with a man project—like a Super, Bat, Spider—and I couldn’t do it. Don’t even tell me how much money it is, because I just don’t have any feeling for that. It doesn’t matter. AVC: For some people, money is a good enough reason. AN: No doubt, I could be richer. I kind of paid to do this project. Everyone sort of paid to do this project. It was a real labor of love. AVC: Being born in New Zealand, do you see yourself as an outsider in the States? AN: Well, you know what it does, it gives you a perspective. I don’t think I could have made this movie if I was born in the belly of the beast. I’ve always had an outsider’s perspective. And now I’ve lived outside of New Zealand longer than I’ve lived in it, so I’m even a foreigner there, which is great. I’ve always loved it—like, when they gave me that card that says, “Resident Alien.” And I thought, “Wow, that’s perfect.” I lived in England for a long time, and even the English didn’t think me as one of theirs. In America I’m not really accepted. In New Zealand now, I don’t think they even think of me as a New Zealander. But I like that, because it gives me that perspective that you’re talking about. AVC: So you don’t want to align yourself with any nation? AN: I don’t have any allegiance to any patch of dirt. I don’t really believe in that. People have said to me about this movie, “You’re taking a left perspective, or you’re taking a right perspective.” I’ve been accused weirdly, in this movie, of being anti-American, and in Europe, I was accused of being pro-American. And I’m not coming at it from any nationalistic or partisan point of view, because it’s a very bipartisan kind of thing—the drone program was started by George W. Bush and escalated by President Obama. It’s probably the only thing Congress agrees on. I come to it from, hopefully, a more humanist point of view. I’m more interested in what it’s doing to people. AVC: And what is it doing to people? AN: It’s pretty evident from Tommy Egan’s character. A schizophrenic war is not an easy thing to deal with. It’s so hard to go to war at home. Go to war, go home, repeat. And that is the future of warfare. Forget about remote control drones, there’s going to be remote control tanks. And you can drive one through Baghdad or anywhere, which is very interesting. It’s just a new tool, but how responsibly are we going to use the new tool? I’ve compared being anti-drone to being anti-internet. Because neither one is going anywhere. AVC: And neither would be pragmatic to reject at this point in time. AN: So now you have to work it out. We have this technology and it’s a very easy sell to the public, because it’s so easy, as you were saying, to not give a crap about Afghanistan, because nobody is coming home in a body bag. AVC: It’s fighting without fighting. AN: It’s cheap, and then on the flip side, it gives you the potential to have a forever war. There’s no reason to stop. It’s very 1984—one of those perpetual wars. AN: But my life is always going to be difficult, because of the material I’m drawn to. Because I’m not drawn to good versus evil, I would run screaming from a project like that. I know that there’s both in all of us. AVC: So are you noble or masochistic? AN: [Laughs.] That’s for other people to say. AVC: We’re not interested in other people here, we’re interested in you! AN: Yeah, but I don’t think too much about what I do, you’d be frightened to know. I just don’t analyze what I do, because I’m afraid I won’t be able to do it anymore. I’m sort of superstitious. John Lennon had the most beautiful quote about this: “If you try to put your finger on it, you can push it away.” [That’s a paraphrase; the full quote is, “Every time you try to put your finger on it, it slips away.” —ed.] And that’s why I’ve never looked back at any movie I’ve done. AVC: You’ve never watched one of your films? AN: After it’s finished? No. If I can’t change it, or fix it, or make it better, I just have to let it go. Once it’s done and it’s released I don’t watch it again. It’s a bit like Picasso, who was banned from some galleries, because he would go in and start altering his own works of art trying to make them better. And so that’s it for me—I can really understand that experience. If I can change it, sure I’ll have a look at it. AVC: The negatives stick with you and the positives fade. AN: Sometimes I’ll be channel surfing or something, and I’ll see a glimpse of something, and I’ll quickly turn the sound down, and then what I look at, that’s an interesting movie. But it’s not me who made it. It’s whoever that guy I was 10 years ago who made it.